The famous singer and actress, Dionne Warwick, is known for her sultry tones and emotional melodies, with great songs such as “Heartbreaker” and “Walk on By”. Dionne Warwick is your Connector of the Day. Her voice has captivated audiences around the world for more than 40 years with over 55 hit singles released. Her first concert in Europe in 1963 with Marlene Dietrich propelled her to stardom, and she has gone from strength-to-strength. The singer and actress was the first solo African-American female artist to be awarded a Grammy in 1968 for best contemporary female vocal artist, an accolade that only Ella Fitzgerald has since won. Performing and entertaining are not Dionne’s only passions. Since 2002, she has been a Goodwill Ambassador for the Food and Agriculture Organization of the UN (FAO). She has been actively in involved with campaigns against hunger and raising awareness for the cause around the world. Do you have a questions you'd like to ask Dionne Warwick? Do you want to know about her career as a singer? Do you want to know about her work as a Goodwill ambassador? Please leave your questions for Dionne Warwick below and be sure to include where you're writing from. I am awaiting Dionne Warwick’s replies. Do you think we are making progress in the battle against hunger, or are we losing ground, and what is the one thing that might make the biggest difference? I just want to tell Ms. Warwick that she has been an 'inspiration' to so many with her life and accomplishments. And her music is Great too. Thank you from 'many' people. What are your opinions of the music industry today? Do you think it's become to much about sexuality and money? 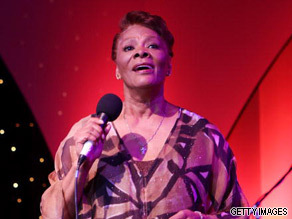 What did it feel like to be the first African American woman to win a grammy? Who are your greatest icons? Dear Dionne, I am a belgian national and living in Jordan for the past 10 years. I have attended several of your concerts around the world. Yes, I am a big fan of you ! However, it is very rare to find a great American singer coming to the Middle East. Though your music is highly appreciated here. ! An Ambassador like yourself of peace and American culture could do so much good by performing once and a while in this part of the world where there is so much hatred towards the USA. Please come, you will do so much good ! Your music with the message of love would do so much good here ! Can you ? God bless you, Erwin. Is there any possibility we will see a rebirth of the Psychic Friends Network? How much time do you spend in Brazil now? Where? I was surprised the first time I heard your name pronounced in Portuguese, "Jenny Warwickee." I wondered, who the heck is that? where do you draw your strength from? and have you always been so certain of yourself and confident? I'd like to ask Ms. Warwick, what is her opinion about today's crop of singers? Does she think there's talent among today's musical acts or are they more a product of 'technology'?? Hi. Dion. You sure are great. Do you think that hunger in the world is due to poor planning, policies and politics or due to natural causes? Consider countries in africa with excellent climatic conditions but always receiving food aid. Thanks. Hi, I am Fortune from Nigeria. Conventional agricultural practice is no longer helping, with the growing population. As a goodwill ambassador for FAO, what are the measures put in place for African countries to embrace plant biotechnology? What is the UN & AU doing about it? Why are muslims (or should I say why is Islam) so violent and radical in nature? A certain Christian Pastor only made a statement which was not carried out, and then a certain sect of people begin protests, burn a nations flag and do all sorts of nuisance? These people must be called to question. Is Islam a religion of Violence and Disregard for Nations? The United States of America must call these people to question. The world must call them to order. I am a Brazilian living in the south of France. I would like to know from Dionne if it is true she lives half of the year in Brazil, in my hometown, Rio de Janeiro. And if this is true, what is it about Brazil that Dionne loves?